While exploring my archive I’ve stumbled on this map of Amman, it was published by “International Media Services”, as you see their credentials at the map footer. It’s really a strange thing to find! I don’t recall how it came into my archive.. it’s like seeing a visualised memory directly in my hands. Anway, the map is really interesting, it shows you the brands, shops, venues and landmarks of Amman two decades ago, I’m sure many of us still remembering few parts of this map, the map of a vivid city who changed a lot. The map, obviously, was drawn by hand, the artist who done that used some weird orientations, so you find Rainbow street is west of Al-Husseini Mosque and they share the same horizontal level, then you keep going west until you reach Abdoun, a few steps after Abdoun you find yourself in the Queen Alia Airport! Funny.. However, the artist made a good effort to draw the building’s facade, I was impressed to see some iconic buildings of Amman drawn in a nice way, it seems like someone did a big research for photos and logos, and delivered them to the artist’s hands. Many brands in this map have been extinct, and many are still surviving, but it still Amman that we love! Bilingual Typography at the map’s masthead. Good job on drawing this building, still exist on the Queen Rania Street. Childhood memories at Jollibee restaurant in Shmaisany. Al-Jahith Treasury / Khazanat Al- Jahith / خزانة الجاحظ is one of my most admired places in Amman, imagine your self isolated inside a beduin tent far a way from all of the city’s headaches between tons and tons of used and rare books! This is heaven for me! 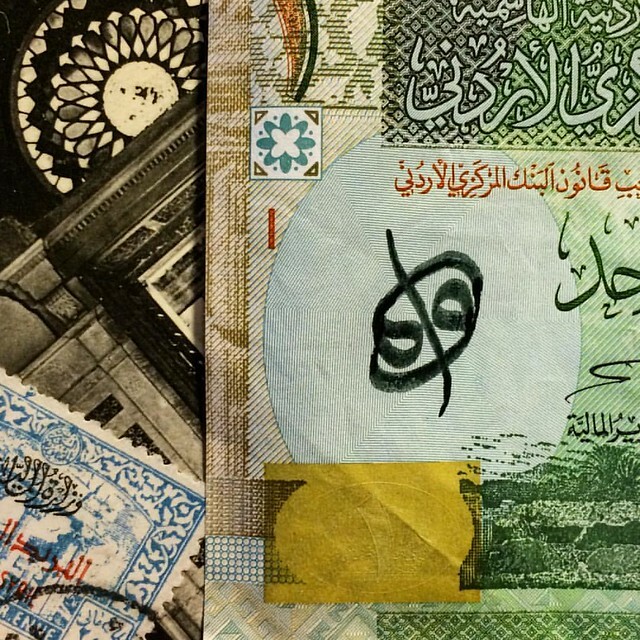 From Alef to Yaa, an experimental project to spread the calligraphy culture and to raise awareness regarding the good written word through Jordan’s bank notes.